In addition to the existing 12-night Classic Northwest Passage itinerary, OOE cements its reputation for innovation with the addition of two brand new voyages on which to experience this iconic journey. 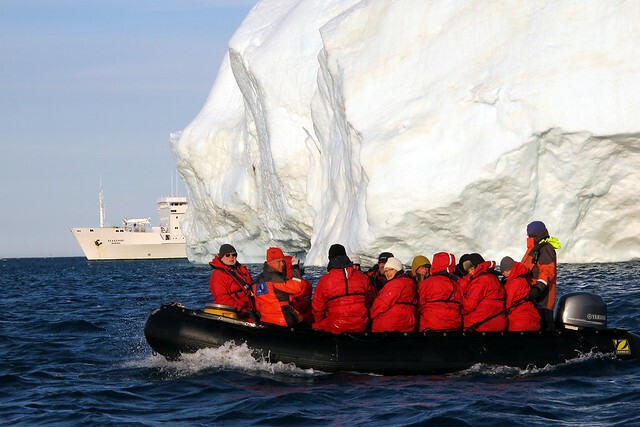 The first, Northwest Passage - Wildlife Encounter, is a seven-night expedition designed for travellers who are short on time but would like a true High Arctic wildlife experience. Highlights include Prince Leopold Island, home to one of the largest migratory bird sanctuaries in the world, where thick-billed murres, black guillemots, northern fulmars and black-legged kittiwakes can be seen in the thousands. This is also a great area in which to spot ringed seals, the main prey of polar bears, which means there’s every chance of seeing the magnificent hunters of the north, too. Sightings of beluga whale and narwhal are also frequent here. Sailing on board Akademik Ioffe from Resolute on Cornwallis Island, the trip departs on 13 August 2016, with prices from US $5195 per person for triple share and from US $6195 based on twin share. The second new itinerary is the eight-night Northwest Passage - Finding Franklin expedition from Resolute on 20 August 2016. The principal focus of this trip to Cambridge Bay, travelling in the footsteps of the great explorers including Sir John Franklin, is the history of Arctic exploration and the early quest for the Northwest Passage. This route is expected to be of even greater interest to lovers of history since the successful find in September 2014 of HMS Erebus, one of the two missing ships that were led by Franklin in his 1845 expedition. OOE is proud to have been one of the partners actively involved in this discovery. Among the most poignant moments of the voyage, passengers will visit Beechey Island where Franklin’s ill-fated expedition spent its last winter before disappearing mysteriously into the frozen landscape, and will cross Victoria Strait close to the site where the wreck of HMS Erebus was finally found 150 years after it went missing. Leading historians will be on board to offer a unique insight into this and other epic journeys through the area. Prices for this voyage start from US $5895pp triple share and from US $6995 based on twin share. Deep fjords, soaring mountains and immense glacial systems act as a stunning back drop as the expedition cruise ship, Akademik Ioffe, travels from Iqaluit across the Arctic Circle to Resolute. Passengers will visit wildlife hotspots in search of beluga, bowhead and the elusive narwhal, as well as walrus and polar bear. They will have the opportunity to explore the shorelines by zodiac, go sea kayaking, hike in two of Canada’s spectacular and otherwise inaccessible National Parks – Auyuittuq in southern Baffin Island and Sirmilik in the North - and mix with Inuit communities who inhabit this remote wilderness. The itinerary includes Monumental Island, a well-known location for walrus, and Isabella Bay, an important summer habitat and feeding area of endangered bowhead whales, which are able to break sea ice with the crown of their heads. Departing on 1 August 2016, the trip starts from US$7995 per person based on a triple share cabin and from US $9995pp based on twin share. International flights are not included in the price of OOE’s cruises and flights Ottawa/Iqaluit and Resolute/Edmonton are an extra cost. However, the company has committed to making the cost of flights to these remote destinations as competitive as possible, and is pleased to be able to offer an unusually low rate of just US $1200 per person for the required northern flights. In addition, subject to availability, there is a 50% reduction on the flight price of US$1200 per person available for the first 30 confirmed passengers on each Northwest Passage and Baffin Island departure during Summer 2016. OOE voyages include accommodation, all meals, 24-hour tea and coffee, use of wet weather gear including wellington boots, shore excursions, landings, educational presentations and guided walks. On-board historians, polar experts, environmentalists, photographers and wildlife guides are also available on shore and in the zodiacs to offer advice and to answer passengers’ questions.